Calories in and calories out is a one day lesson that highlights and explains what calories are, where they come from, and how we manage our weight with them. After learning the basics of calories, students will research how many calories are in a serving of their favorite snack food, and do some math calculations in order to figure out approximately how much time they would need to spend walking and running to burn off the consumed amount. This is a stand alone lesson/activity or could be easily adapted for an interactive student notebook. How do our choices of food and exercise affect our health? What is the connection between food and exercise? Where do we find the calorie information for the foods we’re eating? View the YouTube clip “The Science Behind Food Calories” and complete the questions. Review answers. Review and explain the concepts of Energy Balance and Imbalance and how it affects weight management. 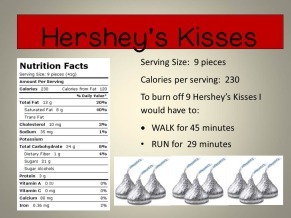 Illustrate the calorie intake and exercise output concept with the Hershey’s Kiss from earlier. Assign students the visual project that can be completed as a poster or as a creative/application entry in their interactive student notebooks. This will require the laptops or access to calorie/exercise charts to complete this along with some basic algebra skills. To reinforce the calorie information or as an assessment, I like to have students complete the “The Day in the Life of a Middle Schooler” chart with my questions. Finishing this lesson now. It was a great 3 day lesson. Thank you.